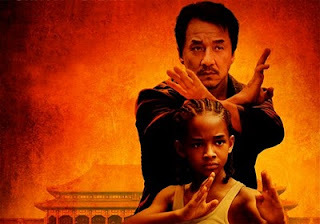 The Jaden Smith-Jackie Chan remake of THE KARATE KID is a high quality, intelligent enterprise, with just enough charm and good humour to get you through the two-hour plus run-time. But it lacks the effervescence of the original, and by making the Kid a twelve year old rather than a sixteen year old, the screen-writers have fundamentally altered the dynamic of the story. Thus, while the original KARATE KID is as much about getting the girl as it is about winning the tournament, in this remake it's pretty much all about the karate and the Mentor-Mentee relationship. The story follows the original closely. A Kid is uprooted to a new town when his single mother moves to a new job. Immediately, he's singled out but the cool kids as a loser and beaten up, turning up to school on his first day with a black eye. The bullying continues until finally he's bailed out by the janitor, who turns out to have mad kung-fu skills. Except, this knowing rename tells us, it's not kung fu, it's karate. The janitor negotiates a truce with the bullies and their mean karate teacher - leave the Kid alone until all matters can be decided at a karate tournament. During the truce, the Kid does repetitive chores for the janitor, not realising that he's really learning mad karate skills, as well as how to respect his elders. And, obviously, when the tournament finally comes, the Kid gets the trophy and the chick, but most importantly, self-respect and a much-needed father figure. If the story is basically the same, the look and feel of the film is very different. Nothing in director Harald Zawart's back catalogue (which includes the risible PINK PANTHER remakes) could've prepared me for his elegant portrayal of a long-haul flight, or his lush photography of the Chinese landscape. There's also a light touch in his handling of the pre-teen crush that the Kid has for a Chinese violinist that is entirely absent from Zwart's PANTHER movies or indeed the AGENT CODY BANKS flics. There's also a lot to like in the script from relative newcomer, Christopher Murphey. I like how he plays with our expectations for the film, and nods to our nostalgia for particular scenes. For instance, the first time we see Mr Chan, he looks like he's about to catch a fly with his chopsticks, the classic move Mr Miyagi pulled. But, no, Mr Chan, actually just uses a fly swat. And while Mr Chan is repairing a car, Mr Miyagi style, the reason is quite different than in the original film. The source of Mr Chan's sorrow manifests itself tragically where Mr Miyagi's sorrow was darkly comic. And while Jackie Chan was more than able to convey that tragedy, I couldn't help but be relieved that he hadn't been asked to mimic Pat Norita's Oscar-nominated performance. There's a lot to like in this remake. The film-makers clearly took a lot of time to work out how best to use the Chinese locations, and incorporate some small details that feel authentic - such as Chinese fascination with curly hair. Jackie Chan and Jaden Smith have real chemistry, and while we all know that Jackie Chan is a charismatic and sympathetic screen presence, Jaden Smith holds his own. But there are problems with the film too. First, it is woefully sentimental, right from the opening scene. The Kid's best friend gives him his skateboard to take to Beijing. The Kid protests but the bet friend insists. Cut to the Kid looking out of the window as his best friend runs after the car in slo-mo. Please. Later, we get to Beijing, and Jackie Chan has just given it his all, letting us into the reason for Mr Chan's sorrow. And what happens next? The Kid leads him out of himself with a device that is pure fructose syrup. It totally brought me out of the moment, and out of the film. Still, all this syrupy nonsense was more than offset by the film's earnest attempt to give us some insight into modern China, and the intrinsic charm of Chan and Smith. What really sunk the film was its closing scene. All of us who grew up in the eighties know how important the final two scenes of the film are. First, we get the Karate Kid defeat his opponent with a highly difficult, daring move that Mr Miyagi taught him. It shows his courage and self control and skill. Ralph Macchio totally pulls it off. But in this remake we get Jaden Smith have to pull of a hypnotic-cobra-type movie that looks utterly punk and ridiculous. I mean, seriously, it's one thing to train for balance and kick your opponent in the head. It's another to think you can move like a cobra and hypnotise your opponent into losing his guard! When the Kid started shifting his head from side to side I started laughing, and not in a good way. Worst still, the final scene of the original film is arguably the strongest of all - it's the ultimate victory - but it doesn't even exist in the remake. In the original, sure, the little bully teenagers are vicious but basically they've been made that way by their mean teacher. The Karate Kid has a good teacher in Miyagi and so can defeat them, but the real battle is between two ways of teaching - two different ways of forming children. Accordingly, it is right and fitting that the final scene of the movie sees Miyagi face off against his rival teacher, beat him, but not with brutal force but with kindness. It is the ultimate victory of the Miyagi way. But in this flick, there is no wider message. The Kid wins, the bullies acknowledge his victory, honour Mr Chan and it's game over. It was just too simplistic and kid focussed - I wanted closure for Mr Chan too. Am I being too harsh on the remake? Am I holding it up to an impossibly high threshold - the high bar of eighties nostalgia? I hope not. I watched the original Karate Kid recently, when it was re-released on Blu-Ray, and the movie still holds up. It's still funny, romantic, tragic, heart-warming and wise, all at the same time. This new movie takes the production values to a new level, and does a genuinely good job of showing us modern China, and Jackie Chan and Jaden Smith are just fine. But I definitely feel the script-writers short-changed us with too much syrup, a too hasty ending, and too long a build-up in the first hour. THE KARATE KID was released in summer 2010 and is available on Region 2 DVD and Blu Ray tomorrow.